The occasion was the launch of 2013’s Timewise Power Part Time Top 50, a list celebrating and promoting the UK business scene’s most inspiring and successful part-time workers. And a pretty impressive bunch they were too, from senior partners with management consultancies to top-rank lawyers, from entrepreneurs to engineers. And, contrary to the stereotype, by no means all women. You would certainly want to be standing at a very safe distance before aiming any of those tired old ‘Thanks for dropping in’ office quips in the direction of any of these high-achievers. (Gags which in MT’s experience arise more from jealously on the part of the full-timers than anything else). 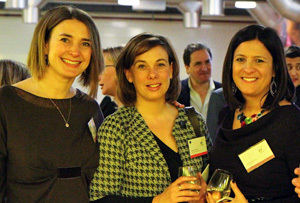 Among those enjoying a chilled white and a canapé at Ernst & Young’s Thames-side London HQ were Alison Lomax, industry head of creative partnerships at Google, (pictured above left), Amelia Torode of Good Relations(centre) and Timewise founder Karen Mattison (right). Addressing the crowd was another star of this year’s list, Sally Bridgeland, CEO of the BP Pension Trustees. Despite holding down a pretty big job - BP’s pension fund has £18bn in assets and 80,000 members - she spends every Wednesday at home with her kids. Her husband - also part time - spends every Friday. That’s the kind of 21st Century definition of having it all MT can relate to. And as Timewise founder Mattison explained, the business case for part-time working needs to be more widely recognised. For starters, a perceived lack of flexibility amongst employers is often cited as one of the main reasons why talented people quit corporate life early. And by formally offering part-time senior roles (rather than converting them to part-time at individual request), firms can steal a march on rivals by increasing the size and quality of the talent pool in which they fish for top people. In fact there was only one gripe to be heard - 'just don’t call us part-time'. Favourite on the list of alternative monickers? 'Smart-time'.